This slim paperback book is a real addition to the book collections of the working jeweler, the jewelry shop owner, the gemologist and interestingly also to your customer, the general public. Wow! It is a compilation of straightforward information on how to take care of gems and jewelry and covers most of the stones in general trade use. At 32 pages it is modest indeed (as too is the price: $ 9.95) but every page is well laid out, visually interesting, concise, accurate, easy to read and find information and best of all has lovely rich color photographs. Fred Ward (who also has a series of five books out on Pearls, Diamonds, Emeralds, Rubies and Sapphires and Jades) was the writer and photographer for National Geographic’s gemstone series for fourteen years. If you’ve read recently about how hard it is to get photos published in National Geographic you may appreciate the photo quality in this book. The book is consumer oriented-that is it was designed as a ‘profit center’ for the average jewelry shop and perhaps more importantly as a premium for stores to give to their customers (price breaks and wholesale pricing are available for this purpose), after all if a customer has just spent between $300.00 and $5000.00 what is six or seven dollars for a gift for them? Especially when it may a) save your salespeople time in answering questions (‘Please take one of these, it will answer your questions about care”) and b) actually keep the jewelry in better repair and more damage free than would otherwise be the case. I showed the book to a number of my students and to several goldsmiths-all felt it was a good book and worth having. One commented that he really ‘liked the simplicity of presentation and clarity of points made’. In particular the pointers at the bottom of every page (one gem per page) is useful. I have arbitrarily selected malachite as an example: “Ultrasonic: do not use, Steamer: do not use, Cool soapy water OK, Toughness: poor, Light: stable, hardness 3 1/2-4, Heat: avoid heat and sudden Temperature changes, Chemicals should be avoided; malachite is attacked by acids: use no solvents”. This kind of brief tabular information could save a piece or two from brutality by your customer, your salesperson and heaven forbid even from your goldsmith. The graphic design is good and clear, I might have liked a light half-toned color under the tabular care information to more easily differentiate it from the page but this is a small point. It was kind of nice to read a book where one looks at the information and finds nothing wrong. 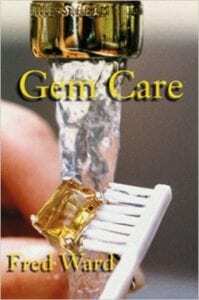 I recommend it and for jewelry stores-consider it as a sales tool. And those photographs are a treat. To learn more about Ward and his books and photographs check out his World Wide Web site.